It can be easy to either forget your passphrase or lose access to your two-factor authentication codes. 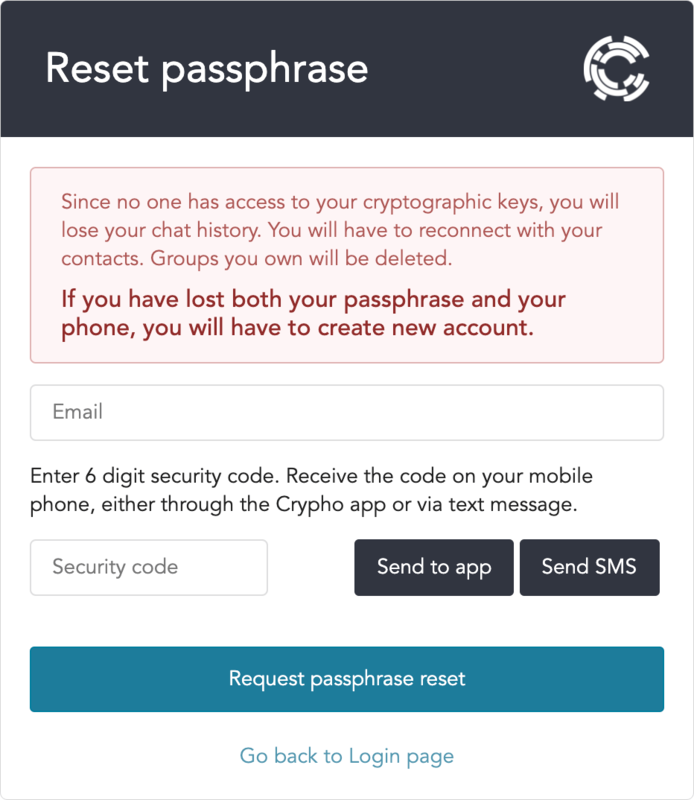 You can request a passphrase reset on the login form at app.crypho.com/login. Click the link in the login form: “Forgot your passphrase?”. To regain access to your account without losing your content and contacts, you can use a recovery key. The recovery key must have been created beforehand. If you have previously created a recovery key, using this will allow you to retain your contacts, groups and shared content. Recovery keys make everything easier. If you do not have a recovery key, you will still be able to reset your passphrase as long as you have access to your two-factor authentication codes. These are the ones you usually receive as SMS messages with six digits. When you reset your passphrase this way, new encryption keys will be generated, and you will lose access to your existing messages, files, contacts and groups. Your contacts will be informed that you have re-set your passphrase and your keys, and must re-confirm you as a contact. Click “I do not have a recovery key”. You should now be presented with instructions on how to initiate a passphrase re-set. In order to avoid losing access to your groups when resetting your passphrase, make sure to create a recovery key.